Philadelphia is the first capital of the United States of America, one of the oldest and most important cities in the country. Rightly called the cradle of American freedom and independence, because it was here that the US Constitution was drafted and signed! In the center of the city there is a very interesting park, which tourists visit without fail when visiting the sights of Philadelphia. In appearance, nothing special, very demanding tourists, he may not impress, and it will be a mistake, because the park is a symbol of the city! Love Park (JFK Plaza) – a love park, a small area, next to the town hall, with fountains, numerous alleys and benches, is located in the heart of Philadelphia, Pennsylvania. The park project was proposed by the “father of modern Philadelphia” Edmund Bacon, who conceived it while still a student in 1932. He realized his idea only in 1957, with the support of the then-mayor of Philadelphia. Construction lasted 8 years and ended in 1965. The park was designed as the final stop for Benjamin Franklin boulevard and was named former US President John F. Kennedy. It would have been so if in the late sixties the city authorities had not decided to decorate the park with a sculpture. Attention was drawn to the work of Robert Indiana with the simple name “LOVE”, by that time it had already gained popularity in various media and was printed on postage stamps. The work had the simplest form, or rather the inscription, the word love – “LOVE”, where the first two letters were on top of the latter. The sculpture was no different from the logo, it was made in red, it only gained volume. This composition was so popular with the young people of that time that the name itself changed, the Kennedy Square became the LOVE Park. In the central square of the park, behind the sculpture, there is a small fountain, which is also called the “fountain of love”. Periodically, during the year, its water is colored in various colors. 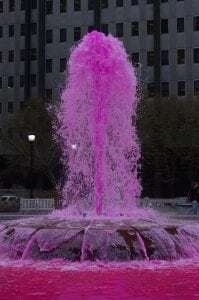 In October, paint a rich pink, in support of the movement “Against breast cancer.” In memory of those killed in the execution of policemen, the fountain gains a blue color to congratulate or support city residents – green. There are also unique cases, for example, for the PR of the television series Dexter, the water of the fountain was painted in bright red color. Until the beginning of the 21st century, the territory of the park, thanks to numerous paths, rails and stairs, was a haven for skateboarders. With their tricks, they attracted to the park a huge influx of tourists, but this for some reason, did not like the city authorities. The park was closed for reconstruction, and after it was opened, this place became not given for skating, and the fine was not assigned a small one. 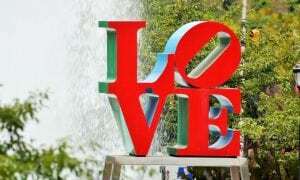 Now Love Park is Philadelphia’s most visited place, tourists and residents of the city are photographed against the backdrop of the sculpture “LOVE”. Couples come in love here, interesting musical performances, various contests and concerts are held in the evenings. Looking at the sights of Philadelphia, it’s impossible to not stumble upon Love Park! Previous PostPrevious Hair Loss Myths: Are These 5 Common Hair Beliefs True Or False?